Spring Hill, Hernando County, Florida appeared on maps back in 1856. They did not become founded until 1967. Spring Hill is made up of approximately 62 square miles. The waterfall entrance on US19 and Spring Hill Drive (which was also known as the Gateway to Spring Hill) was constructed in 1968. The waterfall marks the original main entrance to the Spring Hill community and is currently maintained by the Spring Hill Garden Club. Spring Hill is made up of many gated and guarded communities, some unincorporated communities and many different subdivisions. Spring Hill is a great place to raise a family and a wonderful place to retire. There are so many beautiful parks, golf courses, shopping & restaurants conveniently located. 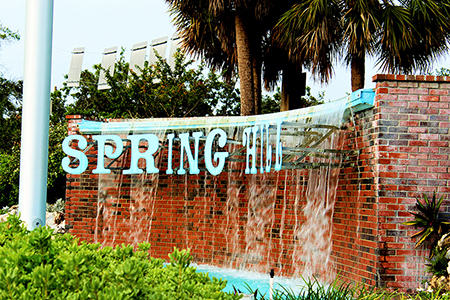 Spring Hill is also a short distance to major cities such as Tampa and Orlando. For local events and things to do, you can check on www.HernandoConnects.com. They have a full calendar of local events and things to do in and around Tampa Bay. Some Hernando County history: During the Civil War, Hernando County primarily contributed foodstuffs, cotton, and lumber to the Confederacy. Although Union ships imposed a blockade on the port of Bayport, runners enjoyed a great deal of success—enough to lead the Union in June 1864 to order some 150–250 troops to destroy Confederate stockpiles in the county. In early July, the expedition marched northward from Anclote River to Brooksville, meeting some resistance from assembled Confederate troops hastily organized to protect the city. The Federal troops won this engagement (known locally as the Brooksville Raid and marched to Bayport, where they and an auxiliary force landing from gunboats sacked Rebel operations. The skirmish between Union raiders and local Confederates is reenacted annually in the county. The county courthouse was destroyed by a fire on September 29, 1877. On June 2, 1887, the Florida State Legislature divided Hernando County into three independent counties: Pasco County to the south, Citrus County to the north, and Hernando County in the middle. Since then, Hernando County's borders have remained unchanged. 811 listings found. Showing 12 per page.